At the end of the term—or whenever a particular student completes the coursework—it's time to review final grades before finalizing the course or student. Here are the instructions for enrolled students; to handle grades for incomplete students, have a look at this article. Go to the course gradebook. You'll find the Final Grade column next to the student's name in the leftmost column. Final grades are automatically calculated throughout the life of the course whenever you grade an assignment. Click Edit grades to change any grade in your gradebook—including the final grade. Click the column name to go to the Final Grade page. The final grade page collects course statistics and notes to help you evaluate the student's coursework. The attendance scores are calculated from when you took attendance. If you've set up an attendance assignment, its grades correspond to these scores. Click Edit Final Grades & Attendance to open the grading fields for editing. You can enter number grades (0-100, with up to two decimal places) in the attendance and grade columns, or select a letter grade from the drop-downs. Click to add course comments for a student. 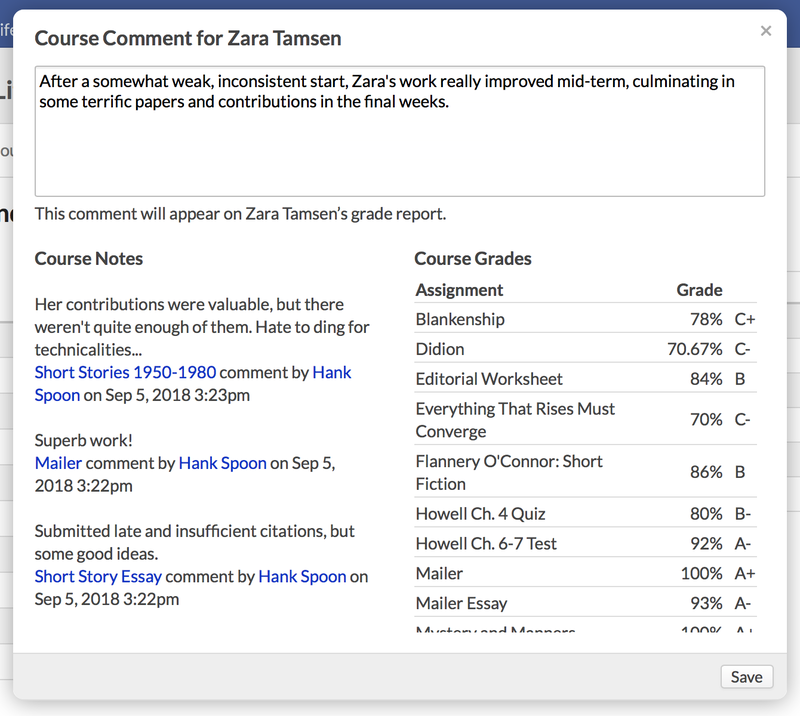 To help you determine the student's final grade and comments, the dialog shows you course notes and assignment grades. This includes roster notes and assignment notes marked private on the student's assignment detail. Enter your comments in the text area. When you click Save, these comments will be ready to print on the student's grade report. After finishing up with final grades, it's time to finalize the course. Finalizing the course submits student grades to the registrar. You can finalize the course on Course > Info view or Gradebook. How are student statuses defined in Populi?